Profit and Loss Questions with Solutions. Quantitative Aptitude Quiz. Welcome to the www.letsstudytogether.co online SSC CGL 2018 online preparation section. If you are preparing for SSC, Railways Exams and other Competitive exams, you will come across a section on Quantitative Aptitude Section. Here we are providing you with Quantitative Aptitude Quiz “Profit and Loss Questions with Solutions for SSC CGL 2018 ” for your daily practice. Here we are providing you with “Profit and Loss Questions with Solutions for SSC and Bank Exams” based on the latest pattern of your daily practice. This “Average Questions with Solutions for SSC CGL” is also important for other SSC & Railway exams such as CPO, CHSL, RRB Group D, ALP & Technicians Exam 2018. 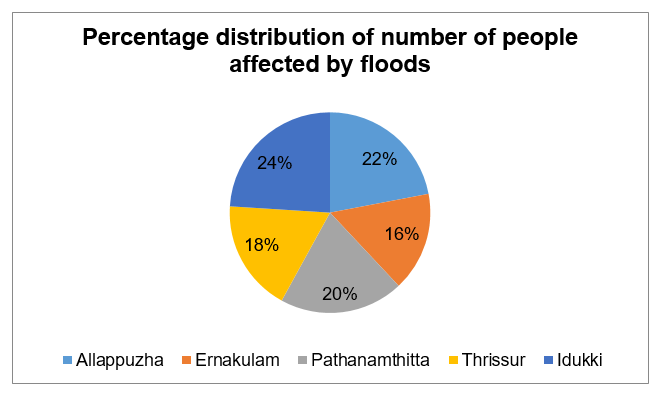 The given pie chart shows the data regarding the percentage distribution of the number of people affected by floods in five different districts in Indian state of Kerala. Total number of people affected in the given 5 districts is 24500. Find the average of number of people affected by flood in Allappuzha, Pathanmathitta, and Idukki district of Kerala. If the ratio of males to females affected by flood in Ernakulam district and Pathanmathitta is same, that is 4:3 respectively, then the number of females affected by flood in Ernakulam district is what percentage more or less than the number of females affected by flood in Pathanmathitta district? Find the difference between the average of number of people affected by flood in Allappuzha and Ernakulam district taken together and average of number of people affected by flood in Pathanmathitta and Idukki district taken together. Find the ratio of number of people affected by flood in Thrissur to the number of people affected by flood in Idukki district. Prime Minister office under PMNRF (Prime Minister’s National Relief Fund) decided to give aid to people affected by flood in Kerala. The ratio of amount given to a male and a female is 5:4, and the ratio of males to females affected by flood in Thrissur district is 4:3. If the total amount given under PMNRF to Thrissur district is Rs. 30.24 lacs, then find the amount received by each male in Thrissur district. Let, amount given to each male and female be Rs. 5x and 4x respectively. The given table shows the data regarding the number of medals won by different countries in Asian Games in a particular year. Find the average of number of Bronze medals won by India, Korea and Indonesia taken together in Asian Games. Total number of Silver medals won by Japan and China taken together is what percentage more or less than the total number of Bronze medals won by Korea and Indonesia taken together? Find the ratio of number of Silver medals won by India to the number of Bronze medals won by Japan. ‘k’ is a quantity defined as the ratio of number of Gold medals won by India, Japan and Indonesia taken together to the number of Bronze medals won by Japan and Korea taken together. Find the value of (k2). Find the difference between the number of Silver medals won by Korea and the number of Bronze medals won by Japan.